Starting 13 August 2018, more and more of creative entrepreneurs are deciding to set up businesses across the globe; and behind every successful entrepreneur, there are stories of mentorship, support, knowledge sharing and networking. Every bit of experience that mentors provide their mentees is invaluable and makes a powerful difference in their future. In view of this, Samsung has kick-started its annual Employee Volunteer Program under the theme ‘Global Startup Acceleration Program’ for the year 2018. The program is a collaborative effort with the Ministry Youth and Sports Malaysia, International Youth Center (IYC) Kuala Lumpur, StartupMalaysia and Malaysian Youth Council. Held at the International Youth Centre (IYC) Kuala Lumpur, the business boot camp saw its participants being mentored by 35 volunteering experts and engineers from Samsung Headquarters. Participants were trained in the areas of business problem-solving such as marketing, engineering, design, business strategy, and more. “There are so many ambitious startups that have seen beyond impressive growth; and as a company that supports the idea of chasing after your dream and making it happen, we at Samsung want to do as much as we can to help budding entrepreneurs realise their ambitions. From this Program, we hope that our participants have been given a boost, and that their business dreams will soon become reality,” said Yoonsoo Kim, President of Samsung Malaysia Electronics. “Our on-going vision is to ‘Inspire the World, Create the Future’. Through initiatives such as this, we believe that these rookie businesses have been given a stepping stone forward, towards a future that all of us dream of. We will continue to help our surrounding communities to the best of our capabilities. To all graduating participants of the Program, I wish you all the very best in your future endeavours,” concluded Yoonsoo Kim. Throughout the 5-day program, a total of 13 participating Malaysian startups were divided into seven teams according to their industries such as education, agriculture, fashion, and more. The goal that mentors had in mind prior to the boot camp was to help participants understand their startups’ vision, needs, business models, and industry challenges. 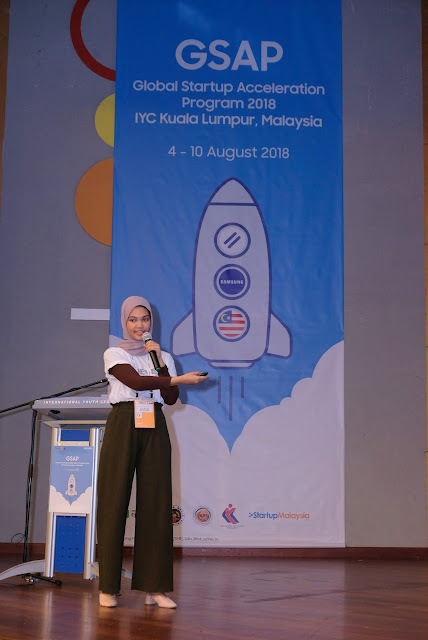 Upon the conclusion of the program, each startup team was given the opportunity to pitch their ideas to panels, and top three selected business models have been arranged to receive extended support through StartupMalaysia for six months. “Winning this acceleration program is something we never expected so you can imagine our thrill when we heard our names being called out. We appreciate this opportunity presented by Samsung and the partners as our vision for our company is now clearer and we are excited to scale our business. This program is unique from others because it focuses on the exact needs of the business, which is exactly what startups require in order to develop in the right direction. The mentors were enthusiastic from beginning to end, giving us the motivation to excel further. We truly believe that the key ingredient to becoming a successful entrepreneur is passion; profit-making is secondary and will eventually happen so long as the products and/or services offered are solid” said Rashid Jamiran, Chief Executive Officer and Founder of Go Coach. Go Coach is a web-based matching platform that connects sports enthusiasts and coaches to create an exciting sporting experience. The company offers affordable coaching prices that players can opt for based on their budgets. It also provides a pool of certified and qualified coaches, catering to the users’ wants and needs. The creators of Go Coach plans to expand its application across five major cities in Malaysia thus increasing user-base. The Samsung Global Startup Acceleration Program is an international initiative, spanning across India, Indonesia, Nepal, South Africa, and Malaysia. Participants were selected by the Samsung mentors themselves, who had to consider various factors such as the participants’ motivation for starting their business, their passion and business models. For more information about the Samsung Global Startup Acceleration Program in Malaysia, please visit https://gsap2018my.org/.